Everybody loves a bright white smile, and there are a variety of products and procedures available to help you improve yours. Whitening at home is big business, with a wide range of options for consumers to choose from. 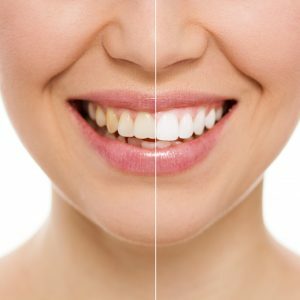 While professional whitening is one of the most popular procedures in the dentist’s office for folks who want to take their smile to the next level. Whitening is a simple and relatively inexpensive way to improve your smile, whether you do it yourself or have it done by your dentist. According to the American Dental Association (ADA), there are two ways to whiten your teeth. One option is using a bleaching agent to change the color of your teeth and remove both surface and deeper stains. The second is using non-bleaching products that just remove surface stains. Deciding what treatment is best for you depends on how quickly you want your teeth whitened and how much you’re willing to spend. Over the counter products use abrasives or low doses of bleaching agents. They can help with surface staining but take longer to see results than professional treatments. Whitening toothpastes: Toothpastes use abrasives or polishing agents to remove minor stains. They can be effective for surface stains, but make sure you choose a toothpaste with the ADA seal of approval. Whitening strips: As with professional bleaching agents, hydrogen peroxide is the active ingredient in many whitening strips. But over the counter kits contain a much lower dose, and results usually take around a week. The cost for a one-week kit is typically $30. Over the counter whitening gels: Like whitening strips, these products contain low doses of hydrogen peroxide in a gel that you brush directly onto your teeth. Results usually take a few days and last a few months. Like whitening strips, these products are more expensive than whitening toothpaste but cheaper than in-office treatments. Opalescence Go: Opalescence Go is a professional, take home bleaching option offered by Hall and Butterfield for just $75. Professional custom take home kit: These customized trays created by your dentist come with a bleaching gel that patients can wear either overnight or for an hour or two during the day. The cost is $250 and compared to over the counter kits, these trays contain higher doses of hydrogen peroxide or longer lasting, more powerful carbamide peroxide. If you’re looking to achieve intensive whitening right away, professional bleaching is your best bet. The high strength bleaching agents available to your dentist allow them to safely whiten your teeth–even below the enamel. Your dentist can use higher doses of hydrogen peroxide (sometimes via a light or laser) so you can see the results right away. This means faster and more effective treatment for a more dramatic result. Your dentist can also use desensitizing products to avoid tooth sensitivity that sometimes comes with teeth whitening. In-office treatments are more expensive than at-home whitening kits, usually $600 to $800 per treatment. But at Hall and Butterfield, our in-office treatment only costs $450. We’re here to help you get the bright smile you’re looking for. After a thorough cleaning and an exam, your dentist will put a retractor in the mouth to expose the teeth, then apply a protective liquid to the gums to prevent irritation from the bleaching gel. Your dentist will apply a hydrogen peroxide bleaching gel to the teeth and will generally do several whitening sessions of 15 to 30 minutes for each visit. Dentists suggest that the most effective teeth whitening treatment combines fast, effective in-office whitening with take-home trays for high-quality maintenance. At Hall And Butterfield, our practice uses the proven Zoom professional whitening system. This popular, light-activated system costs $450 and takes only one visit to achieve noticeable results. Using a safe, high-powered gel and a special LED lamp, Zoom sessions last only 15 minutes, and most patients need three sessions per visit. The final result is that our patients see their teeth become up to eight shades whiter in just 45 minutes. Before your treatment, our staff will fit you for customized take home trays designed to complement the Zoom in-office system. The Zoom day and nighttime whitening systems use hydrogen peroxide and carbamide peroxide to prevent the post-whitening rebound that often occurs. We think Zoom is a great choice for in-office whitening and are thrilled to offer it to our patients. The ADA recommends that you talk with your dentist about whatever whitening system you choose. We’ll examine your teeth, and discuss your budget and timeline to help you make the best decision for achieving a bright, beautiful smile.